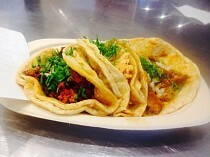 Use FoodCircles' pay-what-you-want model at Tacos el Cunado and support hunger relief. Good food is better when you eat it together. It’s even better when you can eat it for a good cause. Join FoodCircles, EatGR, and Feeding America West Michigan on Wednesday, Dec. 10, at Tacos El Cunado in Grand Rapids’ Downtown Market. Use the free FoodCircles app to purchase a taco for as little as $1 or as much as you want, and all the proceeds will be donated to the Food Bank. This informal gathering will take place from 5:30 to 7:30 p.m. Come on out, enjoy some authentic Mexican food, and support hunger relief in your community. Tacos El Cunado is located at 435 Ionia Ave SW in Grand Rapids.